Suspicions of a pipe bomb placed at William Land Park caused district officials to send out a Rave Alert warning students to avoid the area on Wednesday. 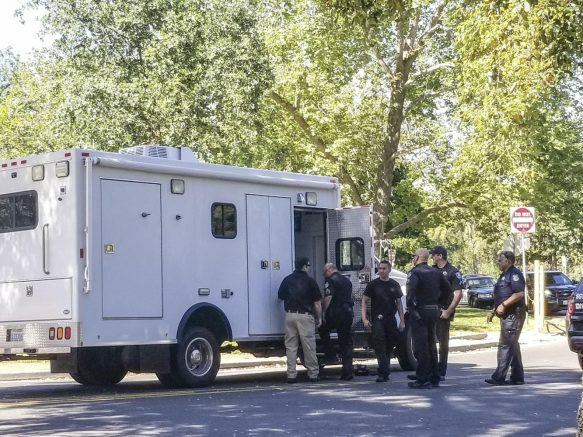 Sacramento County Sheriff’s officers and Sacramento Police Department (SPD) officers were dispatched to the park after to sightings of a suspicious metal rod that appeared to look like a pipe bomb, according to Sergeant Kirtlan of the SPD. Police cordoned off a section of Park Road near Sacramento City College as the bomb unit prepared to dispatch an unmanned drone to investigate the suspicious steel rod. The drone was dispatched by the sheriff’s Explosive Ordinance Detail (EOD) at approximately 9:52 a.m.
A member of the EOD unit wearing protective then approached the package and began x-raying it when the drone was unable to prove conclusively whether the object was a bomb. The Rave Alert was lifted at 10:08 a.m. when law enforcement officials determined the rod was not a bomb. Be the first to comment on "Breaking News: Suspicions of bomb in Land Park prompt Rave Alert"